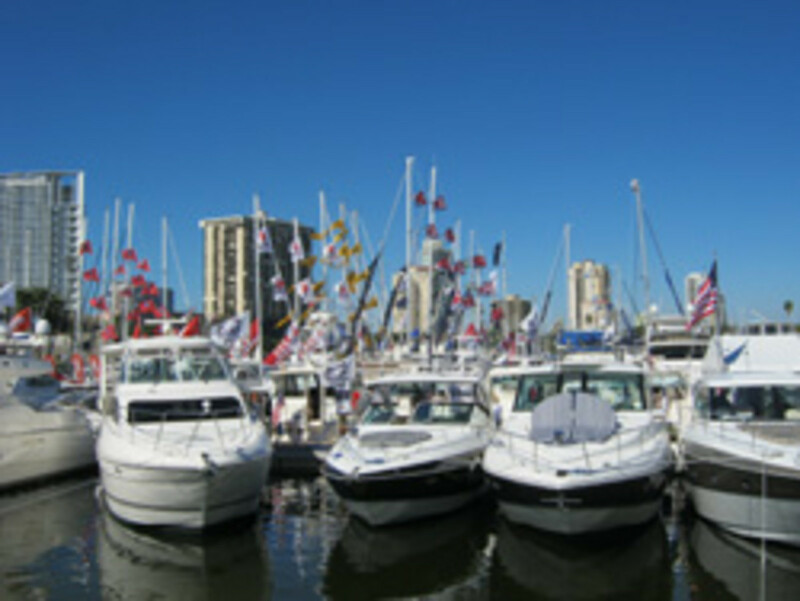 ST. PETERSBURG, Fla. — Under sunny skies, the 34th annual St. Petersburg Power & Sailboat Show got off to a healthy start Thursday with a 25 percent increase in new boats and exhibitor revenue up about 8 percent, said Efrem “Skip” Zimbalist III, chairman and chief executive of Active Interest Media, the parent company of Show Management, which produces the show. "It&apos;s too early to say how the sales are going to go, but I can tell you that the exhibitors are very enthusiastic," Zimbalist said. "They&apos;ve promoted the show a lot; we&apos;ve promoted the show a lot to people all over the area. We sent an invitation to everyone within 100 miles of the show who owns a boat — a personal invitation in the mail." Click play to view scenes from the show. The weather at Show Management&apos;s Fort Lauderdale International Boat Show wasn’t ideal, but the mood among exhibitors and show-goers was upbeat, and Zimbalist is optimistic about the St. Petersburg show. "I think people are tired of depriving themselves," he said. "They want a new boat and they&apos;ve been holding off. People who have the wherewithal are beginning to make commitments to buy. I&apos;m optimistic that the show will be better than last year. We&apos;re still not back to the good old days, but I think things are slowly improving." The number of exhibitors this year is up slightly, from 249 to 255, he said. Although the majority of exhibitors are based in Florida, states such as Alabama, Texas, California, Colorado, Georgia, Illinois, New Jersey, Ohio and Indiana are also represented, he said. Brandon Coward brought his company&apos;s 24-foot power cat — the Splendor 240 SunStar — to the show from Indiana. "Tampa Bay and St. Pete is a really good marketplace for us," said Coward, a sales representative for Splendor Boats LLC in Silver Lake. "Florida is 85 to 90 percent of our market, and we&apos;ve had a good history at this show." The number of new boats — powerboats — from 20 to 50 feet is up by about 20 percent, according to Ricardo Strul, Show Management&apos;s chief financial officer. "The source of growth is primarily new boats — powerboats," he said. "It&apos;s a mix of existing dealers bringing more boats to the show and some dealers getting some lines back or adding new lines." A Hatteras 68 convertible offered by the Tom George Yacht Group of Dunedin, Fla., is the largest boat at the show. This is the fourth year that sailboats have been part of the St. Petersburg show. Eight sailboat companies are showcasing 27 models from 33 to 50 feet, Strul said. The combined sail and power components make for a strong show, Zimbalist said. "We are proud of our Strictly Sail partners," he said. In addition to the boats and accessories, more than 60 seminars are scheduled during the show, which runs through Sunday. Seminar topics include marine refrigeration, anchoring, life raft survival, women and cruising, and yoga for cruisers. Free fishing clinics for children are scheduled on Saturday and Sunday at noon and 2 p.m.
"One of the unique things about this show is the large educational component," Zimbalist said. "People can learn an awful lot about maintaining and caring for their boat and navigating. I would encourage people to come on down." Show Management is offering a free MyBoatShow app for the iPhone/iPad and Android platforms that will allow visitors to get exhibitor and other information, including maps, on their mobile devices. Soundings Trade Only is owned by Active Interest Media.